This is a place for design idea proposals. Approved ideas will be moved into bugzilla and into the design pages. Add short descriptions of your design ideas with links to the mockups or write-ups here. You can create new pages on the wiki or link to the external pages. As this page becomes longer or certain features get implemented, the items on this page might be reordered or moved to a separate archive page. Menus in any application can be accessed via a universal key / key combination such as Super Key + M.
Searchable menu items means faster access. For example, a user wants to make the current page the home page in his browser. He opens Context menu, types "Current Page", the search displays the results (like in the screenshot), he selects the one he needs. Done. A mouse is not necessary to open or navigate through the menus which actually saves time as the user does not have to move the mouse over the screen anymore. This incorporates a touch-friendly interface suitable for tablets or smartphones. Drafting and discussion of the "Activity" concept is here. "Window Trays" mockup for a slightly different approach to window management. This design addresses the removal of the window list, replacing it with a more streamlined alternative that provides similar functionality. "Clever Windows" mockup is a new way of a manipulation windows. 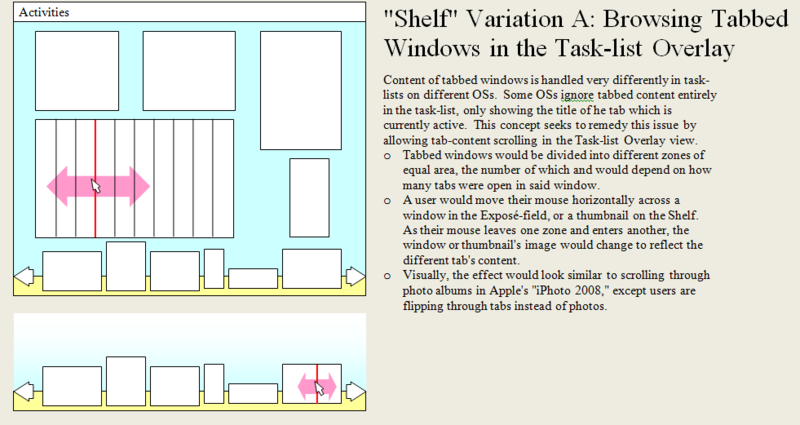 Its like "Window Trays", Headings of windows are always visible, so dockers and application switchers are not necessary. (Updated) This "Shelf" mockup is a revision to the "Frame" UI below. It consists of an single workspace Overlay that divides minimized (which are placed on the "Shelf") and non-minimized windows (which are larger and shown in an Expose view). 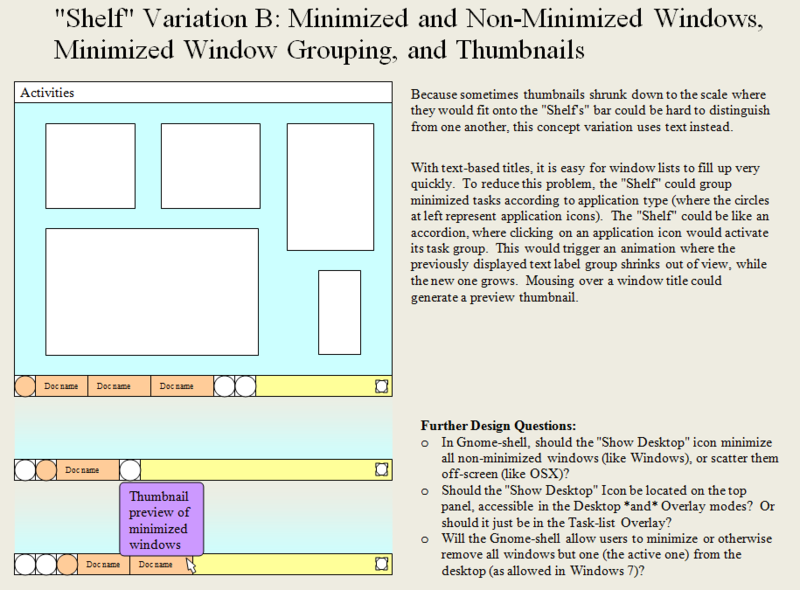 The concept describes hot-corners and window minimization animations, a method for window tiling, and two variations on the Shelf UI ( using thumbnails and text labels). It also suggests methods for rendering tabbed window content in the task-list by mouse scrolling, for stacking windows on the Shelf, and for minimizing all but the focused window. 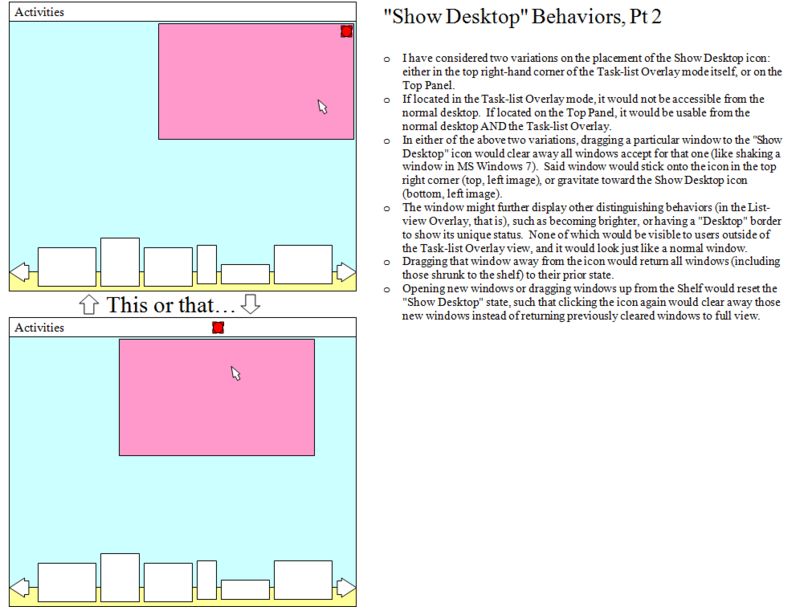 (Original) This e-mail contains a PDF attachment detailing a frame view idea for a single workspace, display of tasklist items in a thumbnails grid when a hot corner was activated, and a method for tiling specific windows. The frame idea was inspired by the the OLPC interface described here. Mockup showing the task list as a drop-down list in the top panel, may be combined with the Breadcrumbs idea. 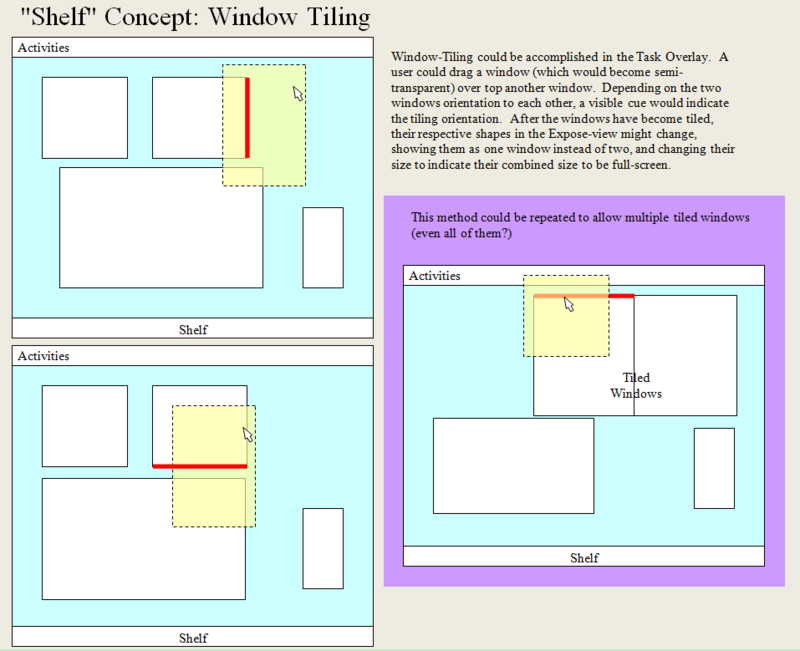 Group Based Window Management is an idea for how to redesign the task list to accomodate the management of windows within and between groups/activities/workspaces. The design might not exactly fit with current GnomeShell designs, but could be informative all the same. Here is a mockup of some body else's mockup of how the "shelf" concept can work with my mockup of Gnome-Shell. 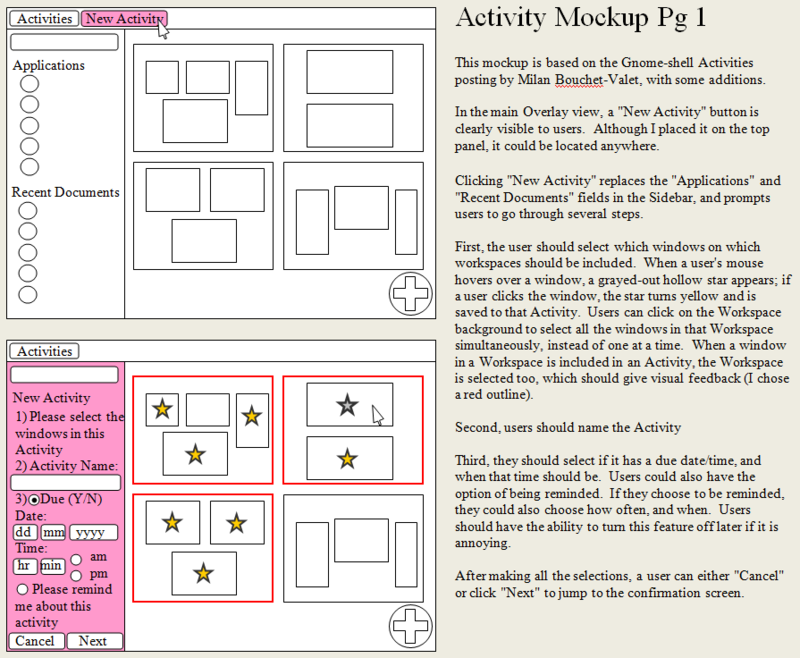 Tiled Group Activities proposes the ability to make "Activity groups" composed of two (or possibly more) applications. 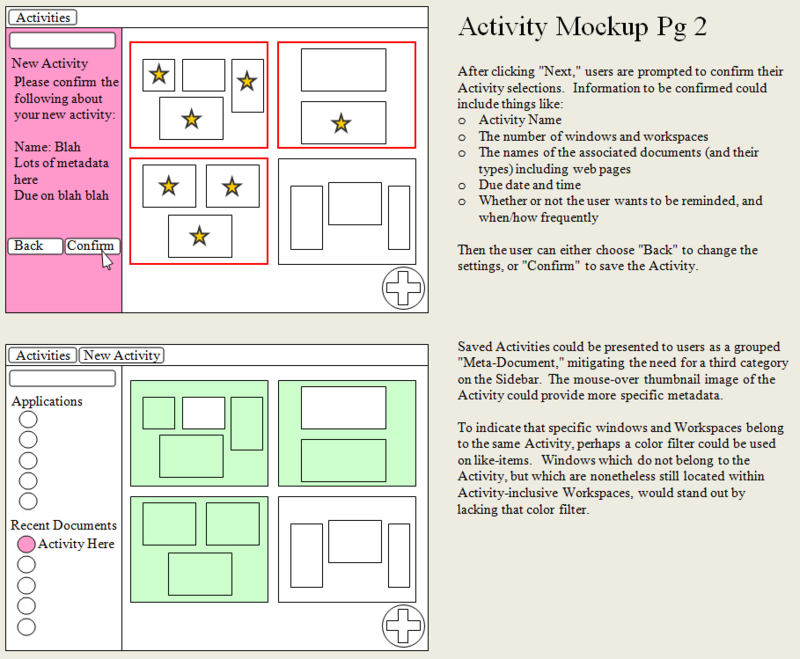 Activity groups would be selected and displayed together using side-by-side tiling. Task list with dock behavior on top. When you launch an application from it, the icon expands showing the name of the application. This helps to select an application between the apps that aren't open. A task list is necessary for change comfortably from an application with a fullscreen window to any other window. Realistic drop shadows. 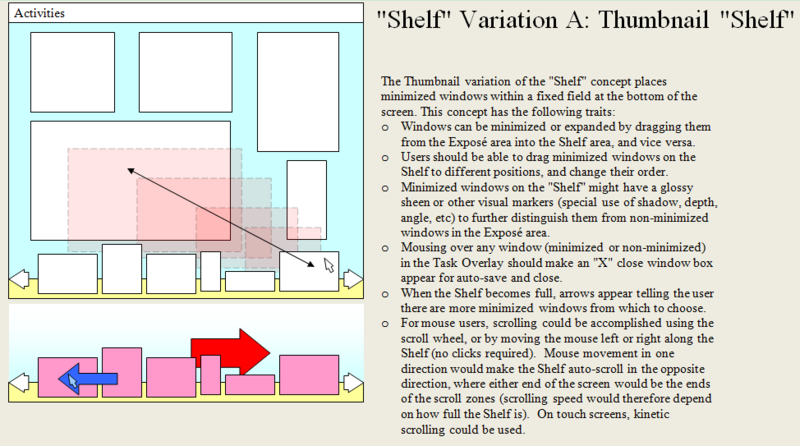 The visual design of window shadows can be improved to better convey depth and stacking order, especially where windows overlap. One of the more developed window management concepts was the Breadcrumbs idea. 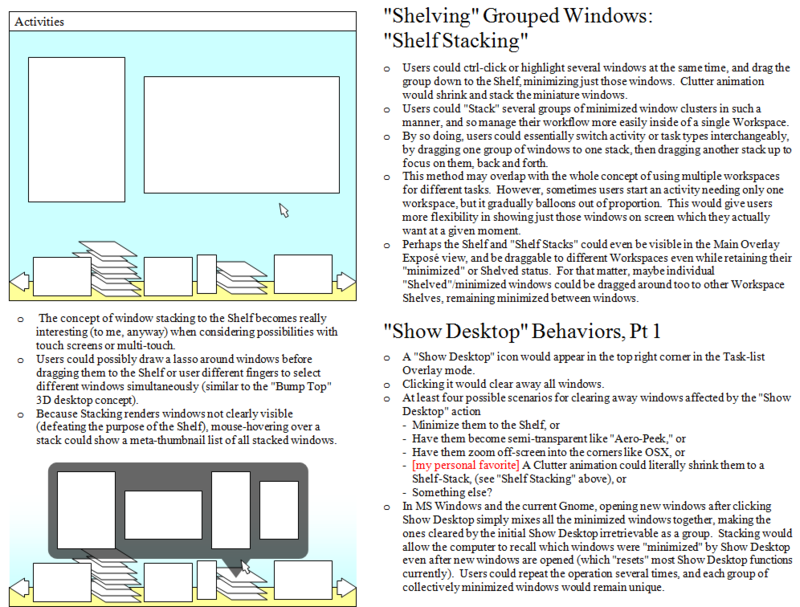 Mockup and notes about breadcrumbs shown in the panel, maximized and shaded windows, windows that request user attention and the user’s name shown on the panel. Improved Workspace Management involves allowing rearranging and pinning workspaces. A quite similar idea to improve worksape management. The idea is one workspace = one activity, see this mockup for more information. this shows ways in which the use of applications can be ignored. The average user doesn't care about what application. S/he just wants to do what s/he wants. There are 2 main concepts - documents and people. This mockup looks at the possibility of creating additional overlays apart from the Activities one, which assist the user to do whatever they want to do. Write-up and mockups of using the overlay search bar as mini-terminal and displaying alternate application view options are here. Do-ifying GNOME Shell suggests some ways in which the functionality of GNOME Do could be integrated into the shell overlay. This page presents a suite of mockup showing how gnome DO could be integrated in the shell. This mockup shows a searchable list where the user can find and select open applications as well as individual windows and tabs. The list will show all items that match the text in the search box. There is also an option to show either icons only or titles as well. This is meant to be highly discoverable and allow users to easily find the document or application they are looking for. Dash groups are an iOS 4/Android ICS folder-like method for grouping different applications in one spot on the Dash. This e-mail offers a mockup and explains the rationale for displaying items on the right in the overlay. 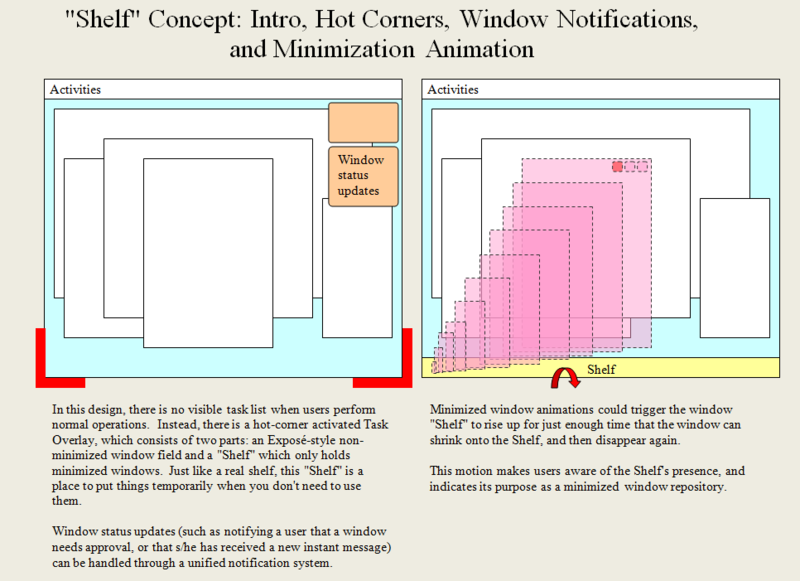 The follow-up contains an interactive mockup that helps visualize the idea and adds a "Devices" section and an "Install an application" link to the overlay mode. The Applications link, Internet category, and the grey button on the left are interactive in the mockup. This mockup suggests displaying item previews inline instead of showing pop-ups. (Updated) This stop-motion video compares two ways of rendering wallpapers as Overlay backgrounds -- then discusses other ways of using light and color filters to personalize Overlay wallpaper appearance. This is a proposal to add more keyboard shortcuts for window management. This mockup is a proposal which I think would simplify and make more useful current proposals. It is very late to change things fundamentally; but I feel that the current development could easily incorporate some of these ideas (since the framework appears to be very flexible). This mockup is a redesign of the gnome-shell with Fitts' law and usability for the average user in mind. The login screen has poor support for keyboard navigation. For example, when booting and at the login screen, it is not possible to select the user other than with the mouse. When navigating in overview mode, it is possible to switch workspace but not selecting the window other than using the mouse, or going to a workspace and hitting ALT+TAB. Switching application using ALT+TAB is awkward and tend to jump from workspace to workspace erratically. Scrolling through the applications list, it should automatically scroll inside groups instead of jumping over them, requiring the user to press DOWN to navigate grouped applications. See the above points on Search Enhancements.